We have founded Götzfried Antique Maps in 2006 to turn a long-term passion for collecting antiquarian maps and atlases into a professional full time business. Our customers are highly experienced collectors who want to expand their collections as well as first-time buyers who have just started to discover the fascination of rare antique maps or who are looking for a remarkable gift. Also libraries, universities and foundations are among our clients. Since 2006 we have served hundreds of map lovers from Germany, Europe and from all over the world. Our offers include copper engraved and woodcut maps, town views, atlases and geographical books from the 15th to the 18th century. You are also invited to visit us and inspect our maps and atlases in Tettnang located near the Lake Constance. Please arrange an appointment in advance. 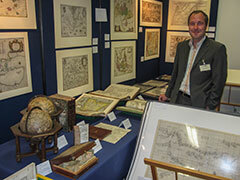 We are a member of the International Map Collectors Society (IMCoS) and exhibit occasionally at the largest European antique map fairs in London, Paris and Milan.